Have you forgotten about those great, good old table games classics. Give them a retry with some great promotions at Virtual City Casino! With so many flashy new slot titles released each month at Virtual City Casino, it's easy to forget just how much fun can be had on the table games. 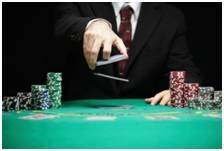 If you've never played them at an online casino before, games like blackjack and roulette are not only great fun, but also quite relaxing when played in the comfort of your home. There's no smoke, noise or pushy dealers to stress you out – you can just take your time and even refer to guide books during play if you want! Take advantage of the promotions below this week and see if you can win a little money for the weekend. This exciting version of American Blackjack first came into existence when gaming was legalised in the resort town of Atlantic City, New Jersey. This online recreation of the great game of 21 follows many of the same rules but with two main exceptions. Firstly, it incorporates 8 decks of cards, which is largely irrelevant to you (unless you are Rain Man! ), and secondly, this version offers the Late Surrender option. This can actually help your chances of winning, so be sure to utilise it wisely! Click the '?' for more info during the game. Play Atlantic City Blackjack Gold this week, and the Top 5 Wagerers each day will receive $100 into their casino account. If you only ever play one online roulette game, make sure that it's this one. European Roulette Gold is the best of the best, with graphics so realistic you'll be rubbing your eyes, and with gameplay so fun you'll be smiling from ear to ear! Stick to the easy red or black, odd or even bets if you're just testing the waters, or switch up to some of the other bet options if you really want to push the boat out. Whatever you choose, just place a bet, spin the wheel, and keep those fingers crossed your number comes up. Try your hand at European Roulette Gold this weekend and 10 Lucky Players will be chosen to receive $100 per day. Won €350,000 using Casino Bonus Money!